Fugoo Sport Premium Price Tag, Premium Bluetooth Speaker? Fugoo Sport Bluetooth Speaker: Premium Price Tag, Premium Product? 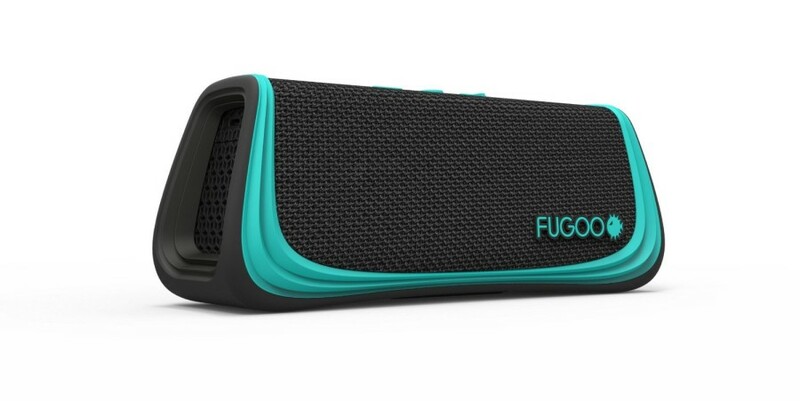 Home » Latest Posts » Fugoo Sport Bluetooth Speaker: Premium Price Tag, Premium Product? The Fugoo Sport is a $200 bluetooth speaker. No, wait, stop. Do not click the X to close this review. You’re going to want to hear why I think it’s worth it. There are almost no other speakers on the market, at near any price, that offer what the Fugoo Sport does. The Fugoo Sport is rated at IP67. 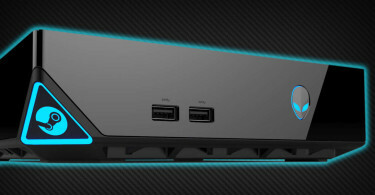 The IP rating system determines the product’s ability to stand up to dust and water. The 6 in the IP67 is the dust rating and the Fugoo Sport gets a top score of 6. The 7 is the rating for water resistance and the Fugoo Sport scored an impressive 7 out of 8. These fancy numbers are great but what do they mean? They mean that the Fugoo Sport is totally protected against dust and things like dirt and mud and rated to work under one meter (about three feet) of water. The omnidirectional directional allows for use of Siri and Google Now on supported phones. Not only can you use your personal assistant but answering calls and using the speaker for your calls is a pretty good experience. The quality on phone calls is good and callers reported that my voice sounded much like it does when I’m using the bluetooth in my car. Not perfect quality but good enough to have a 20 minute conversation without any issues. Fugoo says they’ve created the world’s most rugged bluetooth speaker and while I don’t know if that’s entirely true (there are a lot of bluetooth speakers out there), the Fugoo Sport is really impressive. When you order your speaker, you’re given the option to select from three jackets. I’m testing out the Sport version but you can also get the Style or Tough jacket. The Style jacket adds a bit of flair to the speaker and the Tough jacket boasts the ability to run the damn thing over if you really wanted to. No matter what jacket you chose, it’s still going to be rated IP67 so you’ll retain your water resistance and dustproof rating. The Sport jacket seems to be the compromise between the two looking good while still offering good protection to the speaker without looking too rugged. 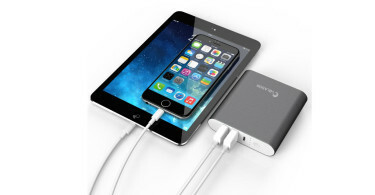 The Fugoo Sport packs Bluetooth 4.0, the newest standard when it was released and all the advantages that come along with it, including power efficiency. The Fugoo Sport boasts an impressive 40 hours of battery life at 50% volume. Now, I’ve had the speaker for a while now and still have not been able to kill it off it’s initial charge. It gets loud enough to fill my very open concept house so we don’t really have to crank it much past 50% so battery life has been excellent. Yeah but none of that really matters if it sounds like crap, right? Well, first some nuts and bolts. 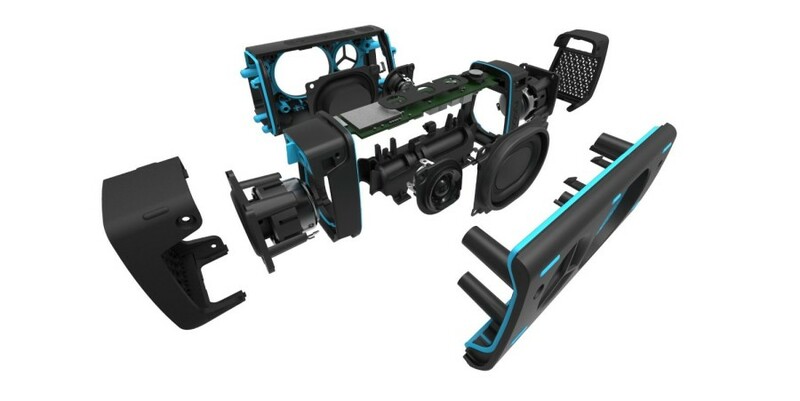 The Fugoo Sport features two 28mm tweeters, two 39mm woofers and two 43 x 54mm passive radiators. The drivers face all directions and are inclined at about 8 degrees because rarely is your speaker at ear level. The Full Range Frequency Response is 60 Hz – 20KHz and the Fugoo Sport supports the aptX codec but both your transmitter (phone, computer, etc) and receiver (in this case, the Fugoo Sport) must support it to receive the benefits. 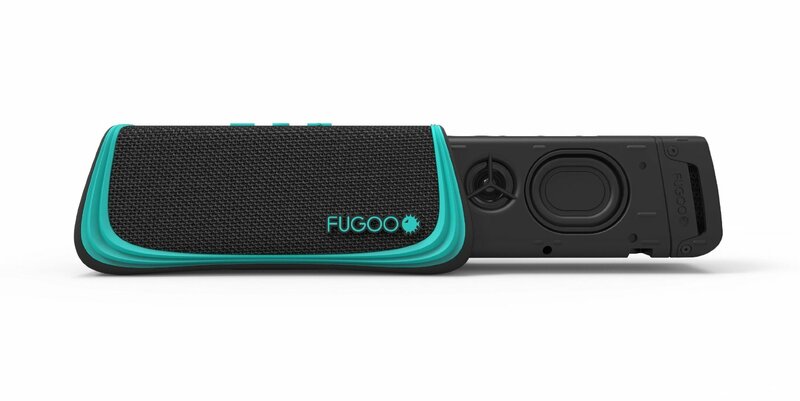 The Fugoo Sport is simply one of the best sounding bluetooth speakers out there. And hell, for $200 it better be. Everything I listed above but if the thing doesn’t sound good, what’s the point? The lows are pretty good for a speaker of it’s size. You’re not going to get window rattling bass and you shouldn’t expect that, honestly. Listening to bass heavy music like electronic, rap, and r&b is pleasing without being muddled by and overly aggressive sound profile. The highs and mids aren’t as crisp some high end speakers but it’s nothing that would keep me away from the Fugoo Sport given the choice. Nothing is muddled in the mids or highs just not as crisp. You’re still going to get everything you’d normally get out of your songs but you won’t get a music changing experience where you’re picking up new sounds you’ve never heard before. I’m sitting here as I write this review streaming “My Head Is An Animal” by Of Mice and Men to the Fugoo Sport. The thing I hadn’t really realized until many hours into reviewing this speaker is how well it’s integrated into my life. The music just sounds good. The quality of the music I’m getting out of the speaker doesn’t make me think about it. That’s one of the worst sins technology like this can make. If you make me frustrated with your product, especially the main purpose of the device, I don’t want to bother with it. The Fugoo Sport definitely delivers there. The function of the device is flawless on top of having good sound quality. I don’t have to mess with my phone to answer a call when I’m streaming music on the Fugoo Sport. The call button on top of the speaker is easy to use to answer and hang up calls and the volume and clarity on both sides of the call is not just good, but great. I had a 20 minute conversation with my father through the speaker and even though I was chasing my kid around the living room he never once struggled to hear me and I never had an issue making out what he was saying due to the good volume on the speaker. 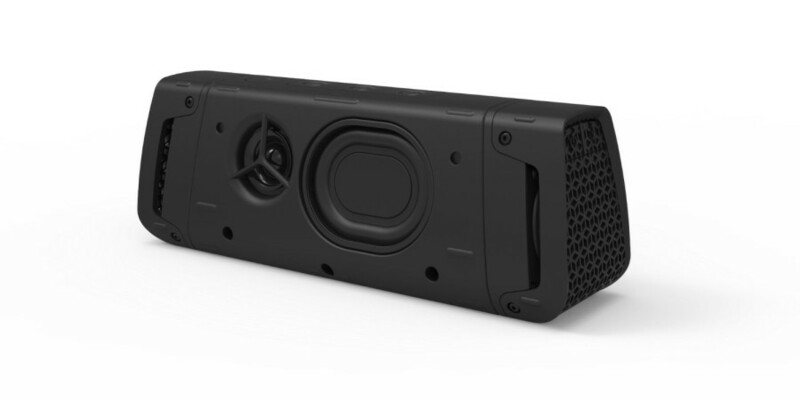 The fact that the Fugoo Sport, and the rest of the Fugoo bluetooth speaker lineup, is rated IP67 puts this over the top for value in my opinion. This really is the ultimate speaker for going to the beach or having a small get together outside. Got buried in sand? No problem. Left it outside in the rain overnight? No big deal. For all the reasons I don’t have to think about this speaker, it should make you think about purchasing it.